Tampa Bay offers a variety of communities to suit many lifestyles. From suburbs with subdivisions loaded with amenities to hip city life to charming historic areas, we are here to help you find a place you will love. 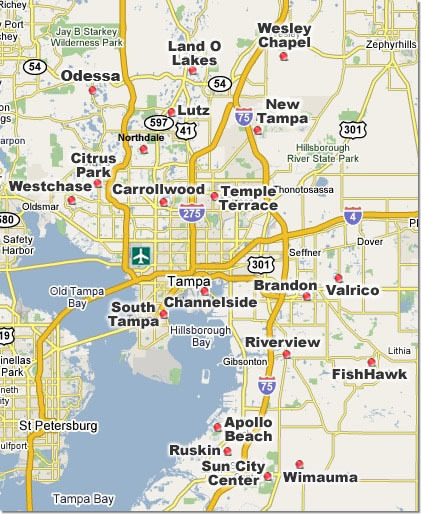 We cover Hillsborough and Pasco Counties. Do you prefer newer areas and love outdoors? Check out New Tampa. There you will find modern communities near terrific parks with easy access to biking trails or canoeing. Drive a little north, and you will end up in Pasco county. There has been much growth in Pasco county in recent years with hot areas like Wesley Chapel and Land O Lakes hosting many new developments. Thousands of young families favor these areas for quality schools and affordability. If you prefer newer suburbs yet want to stay within half an hour commute to downtown, you may want to check out Citrus Park or Westchase located in the northwest of Hillsborough county. Veterans Expressway makes commute to downtown a breeze. It is a more established area with easy access to numerous restaurants and shopping centers including Citrus Park Mall… Carrollwood homes may also work for you, even though it has a totally different personality. You will feel welcomed by charming homes with lush gardens and conveniences of an older, well-established community. Let's not forget about the south of Hillsborough where new communities have been quickly taking place of old country ranches. Brandon area and surrounding Riverview, Valrico and Lithia that offer a variety of neighborhoods from golf course communities such as Bloomingdale to very popular master-planned communities such as FishHawk to more affordable Rivercrest. The residents enjoy the giant Westfield Brandon Mall and proximity to Tampa, Orlando and Sarasota. In case you are not into malls and strip centers and are looking for chic urban lifestyle, Tampa offers Channelside District, a new exciting development next to downtown and port authority. Dozens of new multi-story condo projects are under development since 2001, and the outcome may one day resemble Miami's South Beach with its vibrant nightlife, restaurants and entertainment within walking distance of luxurious lofts. For now the residents of completed condo projects are entertained by the view of big ships coming and going from Florida's biggest port. Ybor City, another up-and-coming area, is only a few minutes away and provides a mix of history, excellent dining and some of the hottest nightlife in all of Tampa Bay. Finally, if you prefer eclectic areas with a lot of personality look no further than South Tampa. Located only minutes of downtown, the area boasts with many prestigious addresses in stylish neighborhoods such as Hyde Park or Davis Island. For exquisite homes look in Palma Ceia and Bayshore Yacht Club that have traditionally been home to city's power-elite. Sidewalk of Bayshore Boulevard overlooking the beautiful Hillsborough Bay is one of the longest in the world and is popular with runners and rollerbladers. The bayfront is also a site to Gasparilla, Tampa's famous pirate festival featuring pirate "invasion", parades, balls, fireworks and celebration on the streets.